I Was Hit As A Pedestrian By A Driver Who Fled The Scene. What Can I Do? Hit and run drivers are a menace to Florida pedestrians. There are several reasons why a driver will flee after hitting a pedestrian. They may have no insurance or, even more dangerous, no driver’s license. If a driver was drinking or under the influence or has a warrant for their arrest they will frequently drive away in order to avoid arrest. Regardless of the reasons, fleeing is a cowardly act which leaves you to face your injuries and medical bills on your own. How Will My Medical Bills Be Paid In A Pedestrian Hit And Run Case? If you own a vehicle insured in Florida you are required to have No Fault/PIP which pays up to the first $10,000 of your medical bills for injuries received when hit by a vehicle. If you do not own your own vehicle, but live with a family member who does have an insured vehicle, you may be entitled to No-Fault/PIP benefits under their policy. There are requirements in order to take advantage of the PIP benefits. The first is that you need to see an approved medical provider within 14 days of your injury. If you receive only chiropractic treatments, your benefits under PIP may be limited to $2500. Your doctor may send you for an evaluation as to whether you have what is known under the PIP statute as an “emergency medical condition.” If a doctor makes a finding you have an emergency medical condition you may be entitled to the entire $10,000 of PIP benefits. Keep in mind PIP pays medical bills. It does not provide cash payments to you for your injuries unrelated to reimbursement of your injury related medical expenses. How Will I Be Paid For Pain And Suffering Resulting From A Pedestrian Hit And Run Case? If you own a vehicle insured in Florida or are a resident relative of a family member who has an insured vehicle, you would be entitled to compensation under the uninsured/underinsured provisions of that auto policy. The simplest way to confirm whether you have this coverage is to look at the declarations page you received from your car insurance company each year, check your policy online or simply call the insurance company and ask. Receiving fair and just compensation after a hit-and-run pedestrian crash can be complicated. You’ll find answers to the most common questions in our popular consumer guide Florida Pedestrian Accident Guide. It is available to download here for free. Have You Been Injured In A Pedestrian Hit And Run Case? Feel free to contact me online or call me directly at 888-207-0905 for a free, no obligation consultation. What Are the Reasons for the High Rate of Pedestrian Accidents in Pinellas County? Pinellas County, along with the entire Tampa Bay metropolitan area, has one of the nation's highest rates of pedestrian accidents. One of the main reasons for the high numbers is that we simply have more pedestrians, according to an article by Alexandra Lundahl that appeared in TBNWeekly.com. Because our weather is mild year-round, we have 12 months when people are out there enjoying a stroll or a bike ride. Not only that, Pinellas County is much more densely populated than most of the United States. It is the densest county in the entire state of Florida, with more than twice the density of Broward County, which is second. And added to that, we have a huge influx of snowbirds and tourists who come south during the winter season to escape the cold climates of the northern United States and Canada, causing our population density to swell even further. These factors create more pedestrians and cyclists along with more motorists, and most of our roads are designed with the motorists in mind. The "car culture" in the state has not been conducive to pedestrian safety. Many of Florida's roads are high-speed arterial highways, designed to get cars where they're going as fast as possible with the fewest possible stops for crossing pedestrians. Pedestrian error is also a major cause of accidents. Pedestrians fail to push buttons to activate crossing signals, or they push them and fail to wait for the "walk" signal to appear. Sometimes they can't be bothered to take the time to walk to a crosswalk and attempt to cross high-speed roads at improper locations. And finally, pedestrian accidents occur when pedestrians and drivers are impaired by alcohol, drugs, or prescription medications. Engineering and education combined are needed to reduce the number of pedestrian accidents. Drivers need to understand that the law requires them to yield to pedestrians, and pedestrians need to understand the importance of using the signals properly, crossing at correct locations, and exercising caution when entering the roadway. A pedestrian or cyclist injured as a result of driver error is often able to receive money as compensation for accident-related injuries and losses. If you were injured as a pedestrian or a family member was killed attempting to cross the road because of a driver's carelessness, talk to attorney Jim Dodson for information on how to proceed. Jim has been helping accident victims in Florida recover compensation for more than 25 years. How Can I Determine How Much My Florida Pedestrian Accident Case Worth? This is a question everyone wants answered, but the truth is if you were hit by a motor vehicle there is no simple formula that can be used to tell you, at the start of your accident case, how much it is worth. What proof is available to show that the driver was the one who caused the accident? How badly were you injured? What kind of treatment are you getting now, and what will you need in the future? How much pain and suffering, both physical and emotional, have you experienced since your accident? Is it likely to continue? For how long? How will your injuries affect your life in the future? Will you be able to return to work or participate in the activities you enjoy? How will the injuries affect your quality of life? Do we have all of this information right after the accident? No, we do not. It takes time for many of these questions to be answered as your injuries require treatment in the form of surgery and rehabilitation or as evidence of video cameras at the scene surface. Pedestrians are often knocked unconscious at the scene of an accident involving a vehicle. You may not remember exactly what happened and it could take time to find witnesses. We work with you to gather the information and the proof we need to ensure every fact that could affect the value of your case is documented. Only once all of these factors are weighed can an estimate of the value of your claim be made. Don’t forget to request the Florida Pedestrian Accident Guide so you know what to expect moving forward with an accident claim. It normally sells for $14.99 on Amazon, but you can get it here free. A Member of My Family Died in a Pedestrian Accident in Florida. Do I Have a Wrongful Death Case? If someone you love has died in a pedestrian accident, you are not alone. Florida is the number one state in the nation for pedestrian injuries and fatalities. Drivers are required to drive carefully, remain focused on the road, obey traffic laws, and be mindful of pedestrians, cyclists, cars, and others around them. When they fail to live up to this responsibility and cause a fatal pedestrian accident, the survivors may have a wrongful death claim against the at-fault driver. Careless or reckless driving that results in a pedestrian death can be caused by any number of improper acts, including drivers running red lights, speeding, driving drunk, failing to yield the right of way, or driving while using a cell phone, texting, eating or drinking, rubbernecking, or otherwise distracted. Wrongful death claims in Florida are governed by the Florida Wrongful Death Statute. To succeed in a wrongful death case it will be necessary to be able to prove that the person who caused the accident was legally responsible for the victim’s death. If so, the survivors of the person who died may be entitled to finacial compensation for the loss of their loved one. The Florida Wrongful Death Statute allows only two years from the time of death to file a lawsuit, so it is important not to delay in talking to a Florida wrongful death lawyer about the case. No sum of money is adequate compensation for the death of someone you love. Nevertheless, careless and negligent drivers must be held responsible for the suffering they’ve caused. For many survivors, pursuing a wrongful death claim is an important step toward healing and closure. Should My Lawyer Refer Me to a Doctor for My Pedestrian Accident Injuries? If the Red Flags are Flying, Head for the Door! If you’re interviewing a lawyer about taking your case and notice a pile of a particular doctor’s business cards in the waiting area, watch out. If the lawyer tries to switch you over to another doctor when you’ve already got one you’re happy with, that’s another warning sign. Time to head for the door. On the other hand, if you need a referral to a doctor with a particular specialty, your lawyer may be able to direct to a specialist to consider. An experienced lawyer will explain to you the pros and cons involved in a referral. You should understand this: you need a doctor who is well respected, knowledgeable, and believable, not one who has a cozy referral relationship with your lawyer! Where Should I Get Treatment for My Pedestrian Accident Injuries? Immediately after your accident you should get the medical care you need. Sometimes you’ll be taken to the emergency room in the nearest hospital. Otherwise, you should visit your personal physician. But don’t delay seeing a doctor. If your own doctor isn’t available, try an urgent care clinic if you haven’t been seen in the ER. For certain injuries, you may need a referral to a specialist—a neurologist, an orthopedist, or a plastic and reconstructive surgeon, for example. There are doctors who don’t care to treat pedestrian accident injuries. If your doctor doesn’t handle this type of injury and can’t give you a referral to one who does, discuss it with your lawyer. Sometimes an attorney can provide you with a list of names of several doctors who treat accident injuries, and you can choose one of them. If you have health insurance, a good place to start is to review the doctors available to you under your plan. It’s always smart to gather information about the claims process, even before consulting with a lawyer. It’s also a good step to have some questions in mind to ask any lawyer you are considering hiring. The best way to start is by reading the Florida Pedestrian Accident Guide by attorney Jim Dodson. Who is Considered a Pedestrian in Florida? According to state laws, any person “afoot” is considered to be a pedestrian in Florida. This means any person on foot, in a wheelchair, on a skateboard or on roller skates is also considered a pedestrian in Florida. The Florida statutes regarding pedestrians state that where a sidewalk is provided, a pedestrian must not walk on the road but should walk only on the sidewalk. In places where a sidewalk is not provided, a pedestrian may walk on the road but should be cautious of cars and other vehicles. When a sidewalk is not provided, a pedestrian in Florida should walk only on the shoulder on the left side of the roadway, facing oncoming traffic. The failure to obey these rules can result in a serious pedestrian accident. Even when a pedestrian doesn’t obey these rules, an accident may be caused by someone else’s negligence. If you are injured because of someone else’s negligence, you may be eligible for compensation in a Florida personal injury claim. When is a Pedestrian in Florida Allowed to Stand or Walk on the Road? Short answer: when they have to be on the road for safety and they aren’t doing anything illegal. According to Florida law, a pedestrian may stand or walk on a road in which a sidewalk is not provided. In such a case, the pedestrian should walk only on the shoulder on the left side of the road. This means the person should be walking against oncoming traffic and never in the actual lane for vehicles. Florida pedestrian laws prohibit a person from standing on a road that is paved for vehicular traffic in an attempt to solicit a ride, solicit employment or solicit business from the occupant of a vehicle. In addition, a person cannot walk on any road where a sidewalk is provided, as long as that sidewalk is passable. Situations where a sidewalk may be found to be impassable include instances of sidewalks in disrepair or sidewalks with safety hazards. Think of construction cones and caution tape blocking access to a sidewalk. Florida pedestrian laws are meant to protect people from the dangers of motor vehicles. A violation of these laws may result in a non-criminal traffic infraction and a fine, not to mention the danger of being struck by a vehicle while in the road. If you were hit by a car while walking in the street and cited for being in the road improperly, you may bear some responsibility for the accident. But, that doesn’t mean you are wholly responsible for your injuries. If the driver was distracted, impaired or simply not paying attention, you may have a claim against his insurance company for your injuries. What Should I Do After a Florida Pedestrian Accident? If you were injured or someone you love was killed in a pedestrian accident, there are certain steps that you should take immediately to protect your health and your interests in a personal injury claim. Call the police – Immediately call the police. When the police arrive they will make a report, which will serve as an official record of the pedestrian accident. Too many people regret not calling the police after an accident when they later find out the insurance card they were given was expired or their injuries are much worse than they initially thought. Get the contact and insurance information of the other person(s) involved – You will need this information to file an injury claim. When the police arrive, they often handle this for you by getting the information of everyone involved, verifying it and compiling it in an Exchange of Information. Get the necessary medical attention – Even if you don’t believe that your injuries are serious, you should see a medical professional right away. You may have suffered injuries that, due to shock and adrenaline, you won’t feel until later on. Often, internal injuries to the organs, traumatic brain injury and whiplash go unnoticed until days after the accident. Additionally, you must see a medical profession within 14 days of your accident to qualify for your No-Fault/PIP benefits. Contact an attorney – An attorney will conduct an investigation and evaluate your case, letting your know whether you have a strong case for compensation for your injuries. For more information on what to expect after being hit by a vehicle, request our free Pedestrian Acident Guide today. If you have questions you need answered right now, give us a call at 727-446-0840. We never charge to discuss your case. I was Jogging in a City Park in Tampa, Tripped on Broken Sidewalk and Broke My Arm. Is the City Liable? If you have broken your arm while jogging on a broken Tampa sidewalk, the city is not necessarily liable just because the sidewalk was broken. On the other hand, if the city had been notified of the sidewalk’s broken condition, they should have put up a sign or a barrier to prevent a pedestrian accident. Therefore, the city may be held liable for your broken arm in some cases. If you choose to pursue damages in a personal injury claim, the city may argue that you were partially at fault for trying to cross the broken sidewalk. The outcome of your case will depend on your ability to present a valid argument. To build your case against the city, you can get the professional help of a lawyer. It is important to keep in mind however that suing a government entity such as a city or other government office has a different set of standards and deadlines than personal injury claims against people or other types of businesses. Often, victims are only allowed only an incredibly short timeframe to notify the government entity of their intent to seek damages. That is why it is vital to speak with a lawyer right away to avoid missing the statute of limitations on these types of claims. After your type of pedestrian accident, you may be compensated for current and, if necessary, future medical expenses. You may also be compensated for your pain and suffering, and any wages that you may have lost. 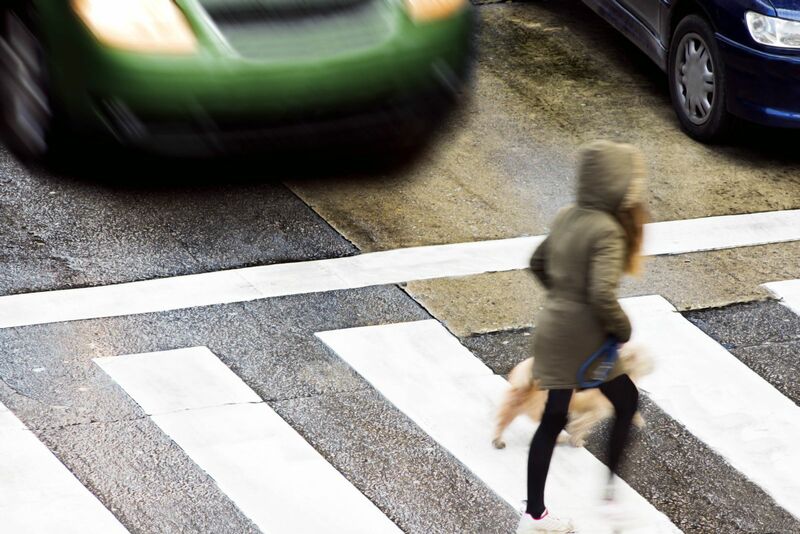 How Does Florida’s No Fault Law Affect Pedestrian Accident Claims? As the name implies, Florida no fault law pays for vehicle and pedestrian accident claims regardless of who was at fault. Florida is one of 12 states that has implemented a no fault system. It was designed to help bring down insurance premiums by preventing frivolous lawsuits. Understanding Florida no fault law and how it applies to your accident is crucial to the successful resolution of an injury claim. If you were injured in a pedestrian accident, you need to report your accident to the insurance company that will be covering you. If you (or a relative who lives with you) are an insured driver of a motor vehicle registered in Florida, you have no fault coverage and your auto policy will cover you, even if you were not in your vehicle at the time of the accident. If you are not an insured driver of a motor vehicle registered in Florida, then you will be covered by the insurance of the driver who injured you. However, you may need to fill out certain applications and agree to a recorded statement. It is best to seek the advice of a lawyer at this time to make sure you are not being taken advantage of by the insurance company. You may have another avenue for recovery if you have Uninsured Motorist (UM) coverage on your auto policy. For more info on this, click here.